Don’t expect the Star Wars droid can become an all-around companion, but its metal body helps you cool your favorite beverage. Sounds cool? Let’s go on for the C-3PO metal can cooler. This is a pretty cool and officially licensed can cooler inspired by Star Wars. It measures 4-1/2 x 3-1/2 x 2-5/8 inches and designed based on C-3PO, one of iconic droids from the universe of Star Wars so its smooth surface shows off those iconic detailing from the original droid. The C-3PO can cooler consists of metal exterior and rubber interior. The rubber inner sleeve hugs a standard 12 oz can in order to keep your drink cool, and a hole on the bottom prevents vacuum and ensures condensate drains. 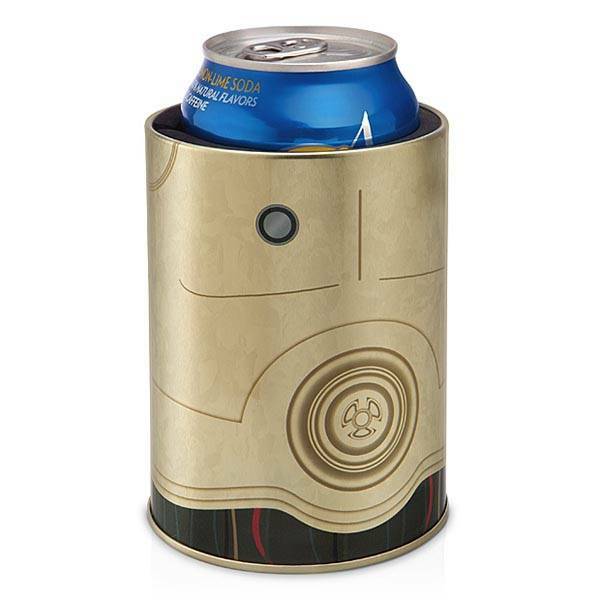 The Star Wars C-3PO metal can cooler is priced at $8.04 USD. If you’re interested, jump to Amazon for its more details. Additionally, also don’t miss R2-D2 can cooler and more geek gadgets by following tags.